Lady Bug or Asian Lady Beetle??? With the unseasonably warm spring in eastern South Dakota this year, we are expecting to see higher than average bug populations. 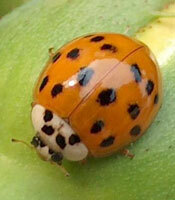 One of the most common pest bugs in the Asian Lady Beetle. While “lady bugs” have always been a “cute” and playful bug, particularly popular with kids, the Asian Lady Beetle is less than “cute”. Multi-colored Asian beetles look similar but are slightly larger than most native lady beetles, with adults measuring 3/8 inch around. They are oval or round in shape, and light orange to red in color (without black spots on wing covers). The beetles’ spots, which often can vary in size, shape and pattern, number from no spots to as many as nineteen; however, nineteen is the most typical number. The head is usually concealed beneath the disk-shaped pronotum, which is white to yellow in color with a black ‘M’ design in the center made of dots. The “cute” common lady beetles (aka: “Lady Bugs”) are different than their cousin, the Asian beetle, due primarily to the number of spots on their back, but also their aggressive nature and scent. Common Lady beetles typically have 4-6 spots on their back and are a variety of orange colors. They are very passive, non-aggressive creatures by nature. They are beneficial insects to the ecosystem that feed on a multitude of plant pests. Typically they do not cause much damage to plants. Asian Lady beetles on the other hand, have more spots on their back, are usually a darker burnt orange in color and are very aggressive. When handled, they can and do bite. If you’ve been around them, you’ll also notice a rather undesirable odor. You should use caution around these bugs, particularly if you are sensitive to bites. Young children seem to be popular targets.